If you’re working in an environment with limited preparation space and cooking facilities, or your business is open extended hours with only minimal staff, you know how such constraints can limit your menu offerings. Operators in such situations are always on the lookout for appealing products which require only minimal preparation and are versatile enough to serve in a range of different styles and to a broad base of customers. New Everyday Gourmet Omelettes from Sunny Queen Farms tick all these boxes. They are a fantastic solution for those foodservice operations that don’t have the facilities or staff to cook omelettes from scratch, yet want to be able to offer customers a quality product made from quality ingredients. 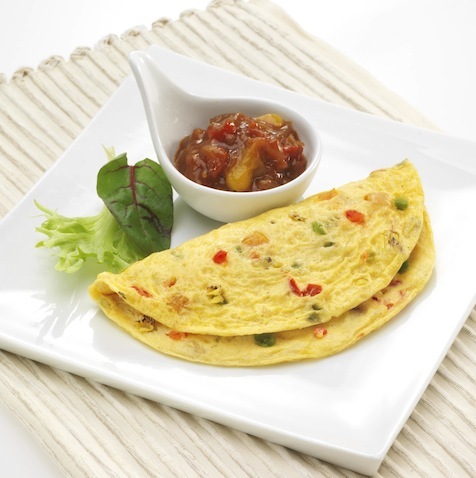 Available in Goats Cheese & Caramelised Onion, or Roasted Vegetable, Sunny Queen Everyday Gourmet Omelettes are made with quality ingredients then frozen, giving them a longer shelf life than fresh eggs and making it easy to keep stock on hand until required and ensuring effective portion control. Made with fresh Sunny Queen Farm eggs and premium quality ingredients, they can be heated in the microwave in less than 90 seconds, or alternatively on the grill or in a combi or conventional oven. Sunny Queen Everyday Gourmet Omelettes contain no artificial colours, flavours or preservatives and are gluten free and HACCP certified as well, so you can offer them to a broad cross-section of customers with confidence – including those requiring gluten free and vegetarian meals. Designed to evoke a rustic, authentic appearance similar to ‘from scratch’ preparation, with ingredients protruding from the omelette base, Everyday Gourmet Omelettes are as versatile as they are appealing. Not only can you serve them as a hot breakfast meal or snack, they’re also ideal as a lunchtime offer in a wrap with fresh vegetables and a chunky relish; as a sandwich or burger filling; and even shredded as part of a salad or fried rice. Sunny Queen Everyday Gourmet Omelettes are ideal to serve any time of the day or night and their ease of preparation and minimal labour requirements makes them an ideal choice for the late night room service menu, or any other situation where you have limited staff and cooking facilities. The consistency of product appearance ensures that irrespective of who prepares it, your customer will receive an authentic-looking omelette with premium quality ingredients and gourmet presentation. New Sunny Queen Everyday Gourmet Omelettes complement the existing Sunny Queen Omelette range of Ham & Cheese, Fetta & Spinach, Cheese & Chive, Spanish and Traditional Egg Omelettes and are a practical, versatile and cost-effective choice for the café, restaurant, bistro and accommodation markets. ALSO NEW FROM SUNNY QUEEN FARMS is its Egg Bake product which can be heated and served alone as a grab and go option or as part of a plated meal. Available in two classic flavours that can be served throughout the day – Ham & Cheese and Fetta & Spinach. For more information on these and the entire Sunny Queen Meal Solutions range call customer service on 1300 834 703 or visit www.sunnyqueenfoodservice.com.au.